White House Explores Ways To Do Business With Cuba : Parallels It will take an act of Congress to lift the trade embargo against Cuba. President Obama, however, does have ways to make it easier for Americans to go to Havana or to sell goods there. 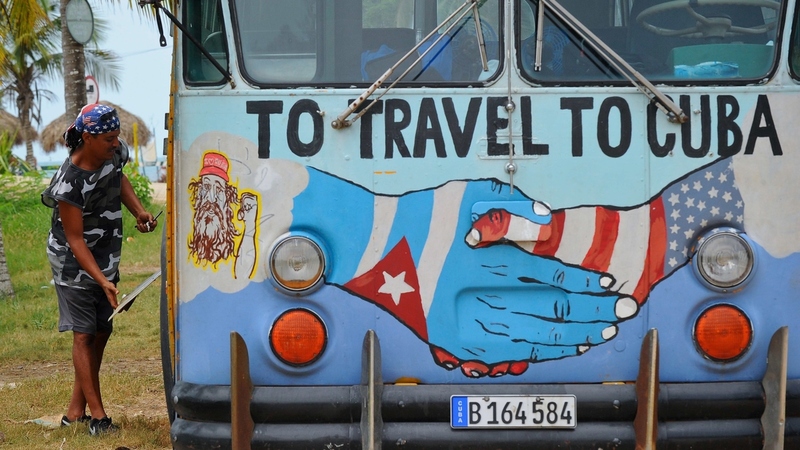 A bus with the Cuban and U.S. flags is seen on a beach in Havana earlier this month. The White House is exploring regulatory changes to provide new opportunities for American citizens and U.S. businesses in Cuba. The Obama administration is considering ways to further ease travel and trade restrictions on Cuba. There is still an embargo in place and it would take an act of Congress to lift that. That doesn't mean this is a done deal. Cuba still has to agree to allow ferries to bring people and goods from Miami. But at least on the U.S. side, he says, it is getting easier to get licenses, especially for sales to Cuba's small, but emerging private sector. He'd like to see the Obama administration go further to boost trade. So would Sarah Stephens of the Center for Democracy in the Americas, who has taken U.S. lawmakers and others to Cuba for many years. She's asked the Treasury Department to change the regulations for travel, too, to make it easier for individuals to go — as long as they are on educational, cultural, religious or family visits, as required by U.S. law. "If individuals are going to Cuba, the money they are spending is going directly into the hands of individual Cubans and that's really the goal," Stephens says. "The folks who travel to Cuba today are subsidizing the Cuban military and the security forces because the Cuban travel industry is completely controlled by the Cuban military. That's a fact," he says. Despite warmer relations with the U.S., he says Cuban authorities still routinely round up and beat up dissidents. He argues that having more Americans going to Cuba or doing business there won't improve things for average Cubans. "The president can leave the U.S. embargo on Cuba like a piece of cheese that's far more holes than cheese," he adds.